"I’d give it to Vardy. Not just for his goals, he also produces assists, but for his all-round effort every week." Hi Matt - so do you expect to lose your status as Leicester's last trophy winning captain in the next few weeks? I don't like to tempt fate, but yes - I have to say I do. Everybody from the manager down is trying to stay composed but the opportunity is there. I see them week in and week out and my view is that they haven't cracked so far and I don't expect it to happen in the last six games. Is Wes Morgan a suitable man to take your mantle? Do you know what, I couldn't think of anybody better. When you think he's spent all his career outside the Premier League, the way he has come to terms with it has been fantastic. His concentration and focus levels have improved. He's realised that step up needs full concentration and he's achieved that. He's quicker and more mobile than people give him credit for, strong as an ox, and is quite inspirational at times for his team mates. In an age when people bemoan the lack of leaders, he's emerged as a real one. I think he leads in different ways. By example as much as anything, he's always 100% committed and gives his all, but also he can communicate with those around him, give them advice and give people a rollicking when necessary. They are quite a tight group, I think. I remember back in my day Gerry Taggart, Steve Walsh and Frank Sinclair - we still are very good mates. We used to give each other hell on the pitch if we thought the standards were slipping but then we would have a beer afterwards and I can see that in this team. Muzzy Izzet's book tells tales about a lot of beers afterwards in those days! This team might not drink like that but they seem just as close. I think that's evident. As you say times change, but they certainly have a tremendous spirit within. Part of that is the core of them have stuck together over a few years, they have been together in good and bad times, that brings you close. Then people who come into the squad pick up on that and get that vibe and buy into the cause. Were you one of the people like Gary Lineker who criticised Claudio Ranieri's appointment last summer? Not to the degree of some people, but I admit I was surprised. It came out of left field somewhere, and I still wonder now how the owners came to consider him. 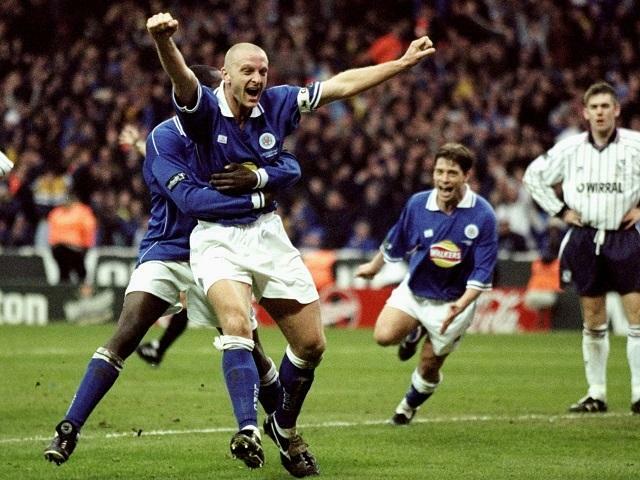 You wouldn't think he was suited for a team like Leicester, he'd been away from English football for a long time, and you wondered if he had a feel and understanding of what was required in the Premier League. He's certainly proved any doubters wrong. The way he has adapted the squad, and the way they have adapted to his way of thinking, is great stuff and he's been superb. So who should be Player of the Year, Jamie Vardy or Riyad Mahrez? Such a difficult choice - and there are a number of others including Wes who could be up for that too, but I suppose they have been the two headline men. How do you choose? Mahrez is so gifted and his record of goals and assists has been unbelievable, but I'd give it to Vardy. Not just for his goals, he also produces assists, but for his all-round effort every week. It's also a fabulous story coming from non-League football which is something you'd understand. Yes, I started life working on a building site and playing part-time, and didn't get to the Premier League until Martin O'Neill bought me from Oxford in the third tier. So what is it like when a big manager puts trust in you and tells you that you belong at that top level? Amazing really. You are on cloud nine - for somebody like Nigel Pearson when he was signed, straight from Fleetwood, telling him he can help Leicester's cause will have been a massive boost. It hasn't always been plain sailing for him, but he's been helped again by Ranieri. They seem to get on, you see them laughing and joking - that helps when you are not feeling the manager is on your back but that he is there to encourage you. His goal for England in Germany - with the back flick - just showed how much he's improved as a result. It was a bit special. To try that flick, and for it to come off on that stage, was superb. I liked the celebration though. He didn't look surprised it had gone in, it was like: 'Oh I do this quite regularly'. The next stage is the Champions League, what happens then? Well they are not going to win it - but then they weren't going to win the Premier League either, were they? Of course it is another step up - but without getting carried away you look at the players they have got and the mood they are in, the confidence they have, and think they are on a roll. They will no doubt deepen the squad, but you look at the style of football they play and you feel it would be suited. They are compact, difficult to play against, hard to break down. They could certainly surprise a few people - again. Thanks for your time Matt and we've a free £50 bet for a favourite charity. Great I'll go for Wishes4Kids which helps children in Leicestershire - and I love my golf so I'll back Jordan Spieth to retain his Masters title at [11.0].